everything should be in release on the upload, i might have got the date wrong on the upload. the component for deemph should be named foo_dsp_deemph. so it shouldnt conflict. Some time ago I asked for Playback Rate Shift to perform simple pass-through (with no processing) when value is set to "0%". I can't find now any change log that would tell me in which version it was introduced AND more importantly - if this is done only in PRS effect or also in Tempo Shift and Pitch Shift. Could you please tell me if all these 3 effects use passing through for 0%/0 semitones etc. setting? the most recent versions should have it, cant remember when i first added it. all 3 effects you mentioned should have it. It shouldn't be too much trouble to add it for the other DSPs. In fact it should be easier as the other ones just modify samples in place and do not change sample pipeline length. I am just wondering if it would be worth the effort. Hello there and thank you for continuing to support this great "tool set" for my favorite audio player. I have one negative point (at least for me): Why can the new Tempo Shift only be cranked up to 75% and not 100% anymore? Call me crazy but I am now used to listen to podcasts at 100% the speed (two times). Besides all the improvements on other effects that one thing is a KO criteria for me and so I have gone back to 0.16 for now. Are there plans to put the "double playback speed" (without mickey mouse voice) feature back in? It seems the rubberband library has a bug when doing a 100% increase in tempo, but not 90%. Weirdly, slowing down by 100% is fine. so if i already use effect dsp for cd pre-emphasis do i need the seprate component or not ? But jokes aside now I know that it is a technical limitation and not just an internal change in settings/variables. I guess offering the old algorithm next to the two new ones as a third option isn't possible anymore? If so I don't see a reason not to offer the maximum possible in your next update, so 90%. Next version should have -95% - 95% for tempo. I want to add effects from DirectX like chorus, its implementation of reverb, and its gargle effect. (assuming I know enough of DirectX COM to do DMOs in threads) Vibrato and tremelo would be nice too. I suppose I can put out a interim build in the meantime to fix the tempo situation you had. I swapped my dll file with the new 0.20.5 and this is pretty good. No noticeable difference. Just joking this is an awesome plugin. The other features too I am using for listening to music (with normal speed!). Hi mudlord, the RIAA CD deemphasis filter DSP from foo_dsp_deemph.dll seems *always apply to the music*, even when "pre_emphasis" tag is not present? Assuming I didn't misunderstand anything about its usage (quote: Usage: create tag PRE_EMPHASIS or PRE-EMPHASIS with value "1", "on" or "yes"). I didn't use foo_dsp_effect, only foo_dsp_deemph.dll, if it matters. Correct. 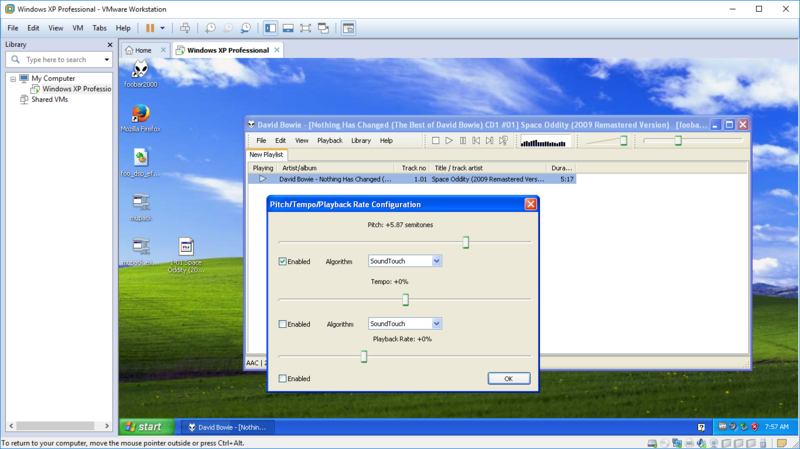 The DSPs listed in the DSP manager are only if you want to use it manually. And by design, lossy inputs are not coded to employ decode post processing. So it's not your fault that it's not working with lossy formats. I suppose I could somehow parse tags for the current song for the RIAA deemph DSP effect? I've relatively new to Foobar and just got round to attempting to install this. It looks amazing, but I've not been able to make it work so far . . . The machine runs on WinXP (I know, don't ask), with user accounts set up. Foobar was installed by user in Portable Mode and by Administrator in Standard Mode. Am I doing something wrong? (I guess that's leaving me open for jests about Win XP, but there you go). Thanks in advance for any help or suggestions, and thanks once again Mudlord for an excellent tool. Ah ok. Though it might be something like that. What a shame, it looks like a real cool tool. Nonetheless I'll check in a VM if it works on XP. thank you so much for all your kind work on my behalf, it is indeed appreciated. Regarding my 'music box': well, compared to me, it isn't old, it is a mere infant hehe. But more seriously, yes, I'm embarrased to admit it is rather ancient compared to today's hardware (but then so is the music that I play lol). I get quite evangelical about it, I worry that we throw away far too much stuff that isn't broke. And accordingly, my place is a bit like a refuge for lost, elderly, unwanted and broken electronic stuff (I think if I'm honest I mean 'hazardous e-waste dump) and - yes - sometimes it is a struggle to keep it operational as the technology progresses. I'm not opposed to technological advance (I used to work in the space industry) but I don't think that built-in or technical obsolescence is very good for us or our successors. Yes, I guess that makes me a bit of a hoarder really lol. But if I can repurpose an old box into something like a linux router, firewall, dbserver or file server, or like in this case an XP music centre, well then that's cool (to me anyway). It all started back in the 1990s when I repurposed a (Dell?) 286 to make a 'Freesco' router so I could share my dial-up connection across some macs and PCs. It booted from a 3 1/2" floppy, and I'd be surprised if it had 1/2 mb of RAM! When that burnt itself out it got replaced by a genuine IBM-PC - a complete antique even back then but really great build quality. Then I was hooked - I think they call it 'life-hacking' these days? If I could recompile your plugin from source without SSE2 for the old XP box then I would, but my knowlege and skills don't go that far and even then, fraid I don't have the compilers, SDK tools etc. to do it. Try the attached build. I set it so only SSE1 instructions are used, hopefully. As for your comments, the pitch shifters should be the only thing intensive enough to need such vector CPU extensions. Rest should be fine without. And yeah, I do understand your point now. Is it possible to set a high pass filter with a slope? whenever I have to do subtraction I'm like "wut?" I need a bit of help setting this up. I've a pair of phones that are fairly linear down to about 80 Hz. From there their response diminishes gradually, and it's around -5 dB at 20 Hz. Is there a filter in this plugin that could compensate for this loss? Basically I want a frequency response that's linear down to 80 Hz, then increases gradually to +5 dB at 20 Hz. Which filter should I use and how to set it up for this type of response? Not sure if people noticed, but I did a major update. It requires the latest FB2K alpha tho. One of the most major changes was to do what people asked for *years*: added support for UI elements.